In the same kind of idea than this question. Gene expression are regulated through complex interactions. The concentration of enhancers and repressors is an important aspect that dictate the level of expression of a given gene. These concentrations can take different value on a continuous scale. Imagine a case where fitness is maximized when a given gene produce n proteins per minute if the concentration of a given protein is greater than x. If the concentration of the protein was to be lower than x, then the gene should not be expressed (0 proteins per minute are produced). In such case, it would be great if a bunch of reactants were to be able to simulate a "switch function" that would switch from "NO EXPRESSION" to "EXPRESSION" at x. It seems to me that such switch function should be very complicated to evolve. I would suspect that all chemical reactions, including the binding of enhancer to promoter region should follow the law of Michaelis-Menten and the Michaelis-Menten function is not at all switch function. So, I have been thinking about cooperative binding. Hill's equation describes a function that is effectively a switch function given that the hill coefficient is high enough. However, seeking a bit in the literature, it's seems that the Hill coefficient never really overpass 3 (or 5 for extreme estimates). A Hill coefficient of within this range gives a logistic function but still looks quite suboptimal compared to what a perfect switch function could do. Are there switch functions in molecular genetics that could translate a concentration into a TRUE/FALSE signal? How well do they simulate the perfect switch function? Are they based on cooperative binding or on some other mechanism? Positive feedbacks can be one alternative. Positive feedbacks exhibit bistability and can therefore adopt one of the two stable states depending on the initial condition. A famous example of a positive feedback switch would be that between cI and Cro in λ-phage, which repress each other. Positive feedbacks also display hysteresis: if the state of the system is dependent on an inducing ligand X such that system attains state S2 at high levels of the ligand, then to switch from S2 to S1 the concentration of X would have to be reduced below the level that was required for the S1 to S2 switch; and vice-versa. In other words, the system tries to remain in its current state. If the transcription factors that constitute the genetic positive feedback have a co-operative behaviour then you can expect a steep switching curve. For details see this review. Transcription interference can also be a good mechanism to provide such switches. Transcription interference occurs between genes in close adjacency to each other. This is basically, as the term suggest, that the neighbouring genes can interfere with each others transcription (by overlapping promoters blocking transcription initiation, collision of transcription machinery on 3' ends etc). In this article all of this is well explained along with a theoretical model called Transcription Interference network. So a switch mentioned in the question can be carried out by this mechanism. Let's take two genes (A and B) that exhibit this transcrigption interference phenomena. 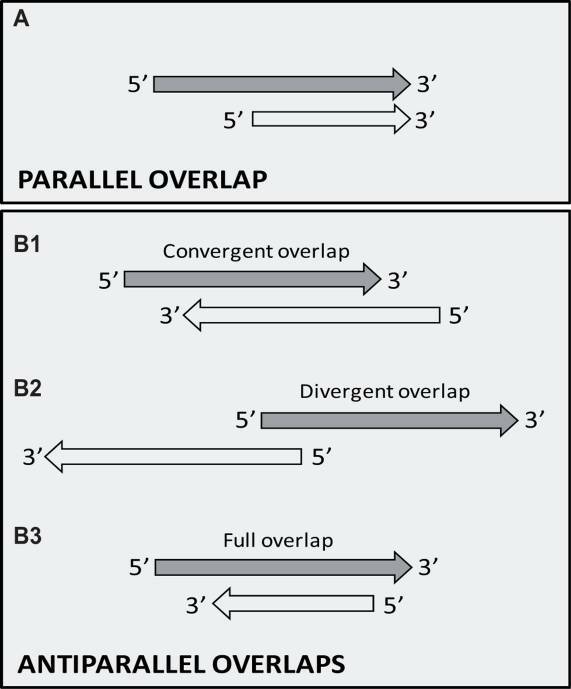 Also let's imagine a gene orientation where the tow genes face each other with their 3' ends like in the picture below ( part B3 but with smaller overlap at the 3' ends). The setup is that gene A is 'stronger' than gene B ( has higher transcription initiation rate), thus at the 3' prime ends it can suppress gene by knockin off the polymerase (there are many possible scenarios when two RNAP-s collide or meet one knocking off the other is just one of them). Now if gene A's activity were to be lowered then gene B could over take and nullify gene A with the same mechanism seen before. In this case transcription initiation would still occur on gene A but it could not produce viable RNA because transcription would terminate early. This results in complete shut down in gene A's expression. Since gene expression and transcription are 'leaky', some minimal activity is basically always present, the above mentioned mechanism can be taken care of. In the article I linked there are many other examples how such switch could be carried out by transcription interference I just took one of them. Also you'll notice that the Transcription Interference Network model is based on such switches. Not the answer you're looking for? Browse other questions tagged genetics molecular-biology molecular-genetics gene-expression or ask your own question.